When I first listened to Chiptunes = Win 2, I felt like I was at a party, where I was acquainted with a few guests, but for the most part knew nothing about the other attendees. Throughout the affair, you begin to meet people and realize they all have a wide range of interests, as well as diverse tastes in music, but all had something in common. It was then I realized I wasn’t at just any old party, but a cult gathering, and I drank the chiptune Kool-Aid. 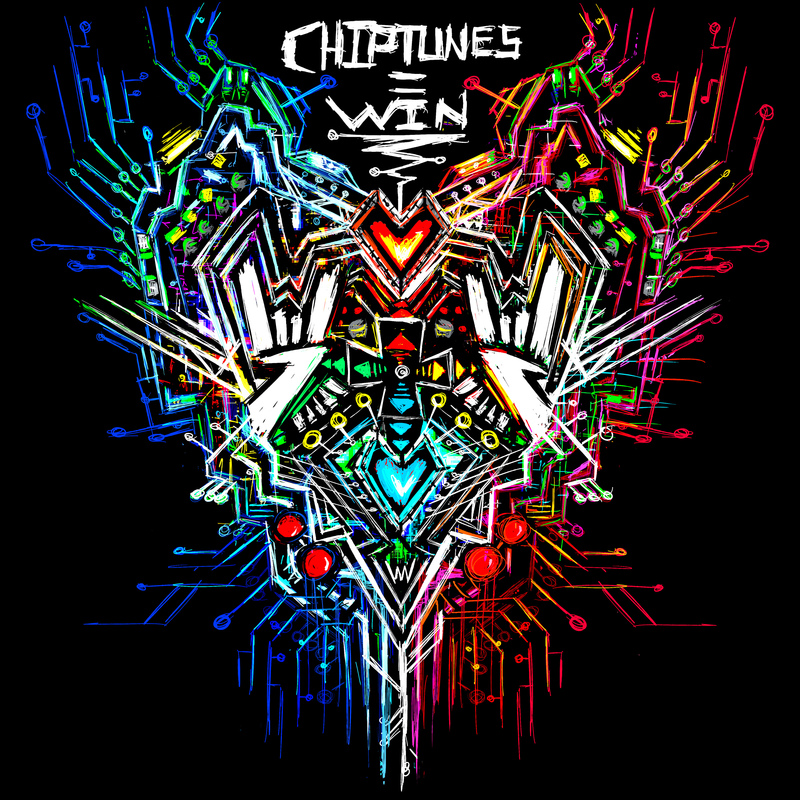 Chiptunes = Win 2 is a mammoth of a compilation album, featuring works by 51 unique chiptune artists, yielding an abundance of influences; punk rock, dubstep, techno, funk, and 80‘s rock, many in the spirit of classic game soundtracks. The method in which artists integrated chiptune sounds was also diverse. Some artists chose a purist approach; creating tracks composed solely of chiptune sounds, while others expanded the palette by including electronic synths, acoustic instruments, or realistic-sounding percussion. Regardless of the route the artists ended up taking, there’s no doubting the excitement that comes with listening to 51 interpretations of the chiptune sound palette. In addition to the diversity of styles and methods of chiptune integration, I felt that every track on the album was strong, both in production and composition. While there may have been a few tracks that didn’t appeal to my taste, I can’t name a track that I found dislikable. Despite this fact, there were several pieces that stood out to me and deserve a “Note-able Track” title. Here are my top 15 tracks. A high-energy track composed of electric guitar-like chip sounds. Each eight bar phrase maintains the similar progression with every repeat, but the texture and melodies are re-imagined with every repetition. I imagine this working beautifully as boss fight music in a retro video game. I love the slow club techno feel of this track, along with the little vocal insertions. While the track uses the same basic progression, Laffe does a great job of keeping it interesting by varying the texture and melody. This track is an absolutely tremendous piece of chiptune dubstep. Auxcide draws you in with a haunting, stretched-tempo (rubato) passage, which is a challenge to achieve without sounding forced. This melody is repeated throughout the rest of the piece, but not without variation or transformation of register or texture. At 8:42, this is the longest track on the album, but it’s so incredibly engaging that the track didn’t feel at all long. The deacceleration at the end was a great touch and was accomplished gracefully without feeling contrived. Incredibly sweet melodies and charming bass lines come together in this track that aims to put a smile on your face. The piece is divided in sections, each with a different feel that made me imagine walking through several levels of the world’s cutest platformer (cuter than Kirby Epic Yarn GASP!). Chiptunes are excellent for making dubstep tracks and Wub Dub de Club by Ryuno is no exception. Starting out as a groovy club techno tune, until a chromatically ascending bassline reaches it’s peak then drops into the classic dubstep “wub” at 1:36, making for a very gratifying moment. At 1:12, Tiny Fungi boasts the title of “shortest track” on the album. The short track length contributes to the piece’s quirky feel, with short, articulated phrases and no clearly defined theme or harmonic progression. It feels like a collage of small musical ideas that strangely happen to fit together. All in all, I greatly enjoyed the “weirdness” this track had to offer. Starfish Riot is an intensely groovy track. I was drawn to how full the track sounded, from the drum track, to the catchy bass line, to the floating melody. Snooglebum covers all basses (pun intended). This off-the-wall track had me from the very beginning. The melody reminded me of a track from Pokemon (Gameboy) that had sort of gone wrong. I love how the time signature is obscured through de-emphasizing beat 1, which is always an effective device. I felt like this track had two pieces in one, since the second section felt very different from the first, but I thought they complemented each other well, especially when the first section returns at the end. Also, I thought the ending was very solid. There are many reasons why I like this track: It’s energetic, has great melodies that take unexpected turns, uses secondary dominant chords to it’s advantage, and is contrapuntal without overloading the ear of chiptunery (that’s a word now). PROTODOME has a legacy of holding the coveted “last track” slot, which he also held on the first Chiptunes = Win album. FM Galactic Girl is a short and incredibly delightful track, making use of wobbly grace notes and ascending figures with a sweet melody. At 1:36, it’s a super short track that I can’t help but love. First of all, Buttdawg Funk is a fantastic name, and I highly recommend reading the poem. From the funky bassline to soaring melodies to rhythmic e-piano, Buttdawg Funk is a truly funky experience to be had. Joshua Morse’s Just Missed You will transport you to chiptune heaven via the funky-fresh smooth jazz elevator. If that doesn’t sum it up, then I don’t know what does. Holding the “opening track” slot on the album is Just the Right Amount of Whelm, a highly energetic and epic track by Starpilot. Endlessly pulsating with tight melodies, epic harmonic progressions, and a kick-heavy drumbeat, this is the perfect track to open the album. Dastardly Deeds embodies everything that makes 80’s rock awesome; crunchy basslines, funky synthesizers, heavy reverb on the kick, wacky electric guitar solos, and classic 80‘s drum fills, to name a few. However, you get the sense that Monomer is clearly paying tribute to this genre of music and not banging us over the head with satire. The use of chiptune in an 80’s rock tribute seems natural, especially when you consider that the NES was released in America in 1985. Despite these facts, this piece rocks. In case it doesn’t seem obvious by now, I’m a sucker for short tracks, and Ain’t Got Time to Bleep is no exception. I love the rhythmic complexity, contrast in texture, chromaticism, interesting structure, and the development of musical material. This fiery track ends perfectly and at the perfect time, but at the same time leaves me wanting more. I did listen to this album from beginning to end, and I’ll admit that I became fatigued by the onslaught of energetic tracks, due to the near-absence of chilled out, slow tempo tracks. On an album of 51 tracks, there are only two tracks I would classify as being relaxed. This is of course not the fault of the artists or the curator, given this is a submission-based album. My hope by writing these words is to inspire the future submitters to Chiptunes = Win 3 to contribute more chilled-out tracks to the track listing. Chiptunes = Win 2 is a truly representative example of the level of musicianship and creativity in the chiptune community. I’m floored by the amazing artists who have contributed to this album, as well as the folks who made the project possible. Keep it coming! Can’t wait for Chiptunes = Win 3. Check out Chiptunes = Win: Volume 2.